In the early days of the internet, many businesses could get away with not having an online presence, especially since it required hiring a professional coder to create a website. However, a lot has changed. These days, thanks to the creation of website builders, even mom-and-pop-shops or at home bloggers can easily create their own beautiful website without having any prior experience. If you’re starting a new business and need an e-commerce site, or finally getting around to it with your current company, it’s crucial that you not only have a website but that it stands out amongst the oversaturated crowd. While visitors may not be able to explain in detail what makes a good website, they are more than capable of identifying a bad one when they see it. So, if you want to create the best website to showcase your business, keep reading to discover the best website builder features as well as tips for making a user friendly website. Building your own website used to both break the bank and require specialized knowledge. Fortunately, we now live in a time with “drag and drop” website builders that allow you to make a fantastic website without knowing a lick of code. These are also called “WYSIWYG” editors, or “What You See Is What You Get” which makes the creation process very simple. By removing the technical barrier to entry, the cost in both time and money to create your own site has dramatically lowered. How many users are there? – A happy and thriving user base is demonstrative of a useful good or service. Domain.com has tens of thousands of users who have used their services for domain registration, website creation, and web hosting. How much does it cost? – Obviously, cost is one of the largest factors in determining the best website builder for you. Domain.com has three affordable options, starting with a Basic Plan that is free with the purchase of a domain name. How’s the customer support? – You’re in for a headache if your website goes down or issues arise and you have no one to help fix the problem. Domain.com has a 24/7 customer support line ready to troubleshoot anything that happens. Drag and drop website builder – Create up to 6 web pages using the easy building feature. Drag and drop anything from text, pictures, videos, logos, and other page components. No coding or previous experience is necessary. Pre-built sections and pages – If you do not want to create everything from scratch, there are a plethora of pre-built sections and pages that you can select from. If you like them, you can keep them as is, or you can customize by simply adding or removing parts. You can also change fonts, colors, and a variety of other design elements. Mobile friendly website templates – Mobile is every bit as important as your desktop website; therefore, it is critical that you invest the time in ensuring that mobile works brilliantly. There are more than 100+ mobile-friendly website templates that you can choose from. SEO tools – Search engine optimization can make the difference in whether your online business fails or thrives. SEO tools allow you to add keywords and other such metadata in order to track and improve your SERPs, click-through rates, and conversion rates. Read here for current SEO trends. Stock image library – There is a massive library of stock images you can use to help tell your story. Images are an important aspect of messaging that many forget or underutilize. The wide selection of stock photos means that you are practically guaranteed to find the right pictures for your website. PayPal integration – Sell your goods or services directly through your website or Facebook page with PayPal integration. This service accepts credit cards and grants store access to mobile, tablet, and desktop users. Unlimited pages – No maximum number of pages or artificial limit. You have the ability to create as many pages as you want with the unlimited feature. Revision history – Your website may undergo various changes during its lifetime; some good, and some not so much. Revision history allows you to go back and see past versions of your website and revert to those versions if you so wish. Custom favicon – Favicons are “An icon associated with a URL that is variously displayed, as in a browser’s address bar or next to the site name in a bookmark list.” With Pro, you can create your own customizable favicon. If you want to know why favicons can help your business, read here. Google Analytics Integration – Google Analytics help you get to know your visitor and customer. It allows you to paint a clear picture of your website to gauge performance, marketing, products, and content. All of this information helps provide insight on ways to optimize your site and grow your business. E-Commerce Shopping Cart – The shopping cart allows you to sell your goods or services whether a user is on a desktop, tablet, or mobile device. Inventory Management – With inventory management, you can track your inventory and stock. Payment Processing – You want to give your potential customers various means to pay for their purchases. With this feature, visitors can choose between PayPal and Stripe. Coupon Codes – Coupon codes provide a way to entice customers. Deals, even small ones, tend to drive sales. As time passes, you will inevitably run into issues that require some expertise and troubleshooting to fix. WordPress Live is a fantastic service that seeks to help you solve any of your website building or maintenance issues. If you do not have the money to have a website creator on retainer, WP Live is an excellent alternative as Domain.com offers three affordable plans: WP Live Lite, WP Live, and WP Live Pro. Guides – WP has hundreds of helpful guides on building your website. These tutorials help you save time as you create a beautiful site that not only looks great but functions perfectly. Utilize social media and integrate those features onto your site. Learn methods and means for growing your audience and building traffic to your site. Analyze data to look for weak spots or strengths in order to increase click-through and conversion rates. Optimize videos and images on your site so that each page loads and responds in a reflexive manner. Screen Sharing – With this feature, you can get live step-by-step help on your website for any issues that cannot be solved over the phone. Whatever your issue, WordPress Live has a solution. Have a clear goal in mind – Websites serve different purposes according to their owner’s need. Whether you want to sell something, build an audience, or share your talent, your website needs to be developed with your specific goal in mind. Creating a generic website will waste an opportunity to generate a new customer or fan. Create Your Content – Even if you plan on hiring a writer to edit or polish the content on your site, you should have a thorough understanding of your messaging. The goal of your content should be to state your purpose briefly and then tell your audience why they need that specific product or service. Use a call to action – Every page on your website should encourage the visitor to do something. Whether that be calling, signing up, downloading, or purchasing, you want to entice your audience to take what they’ve read and then act on it. Do not ignore mobile – According to Statista, 34.5% of all e-commerce purchases are performed on a mobile device. If trends continue, this number is expected to surpass 50% by 2021. As a result, it is vital that you create a site that is responsive and works flawlessly on mobile devices. A bad mobile experience with a website is one of the quickest ways to turn away potential customers. Keep it simple – Quite often, less is more, especially when it comes to web design. You do not want to clutter a page, overwhelm a new visitor, and detract from your message. Keep your pages simple and clean by sticking to minimal colors. Use photos and media sparingly as a means of highlighting or emphasizing your messaging. Utilize white space in order to create a natural flow and to break up sections. More and more we see simplistic design at the forefront of quality web design. Make navigation easy – Moving through your site should not be some sort of treasure hunt. You want the navigation menu to be easy to spot and use. It is critical that each page redirects back to the home page. Tell your story – It is important that you captivate your audience by telling them your story. A business is often a proposed solution to a problem the owner encountered at some point in their life. By highlighting the reasons behind building your company, you can connect to your site’s visitors in a much more personal way. People love to hear stories, so tell them yours. Invest in a logo – Although it may cost more than the website itself, hiring a professional to design your company’s logo is a fantastic form of branding. Logos are a simple way to spread your message with just an image. If you choose to hire a designer for this task, ask them to create it as a .PNG file so it has a transparent background. 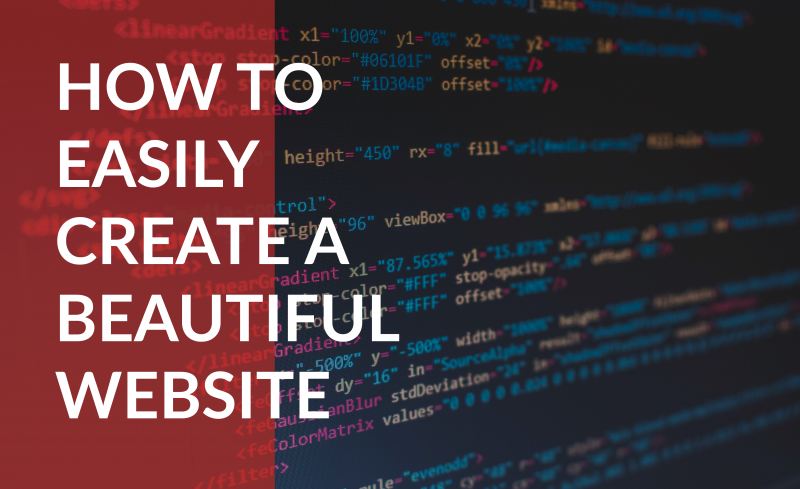 Doing so will help it blend in seamlessly with your website’s header. The thought of creating your own website should not be a cause for anxiety. With Domain.com’s website builder, the process is stress-free. Simply sign up and you can get started immediately. If you have any questions about domains or building out your website, our experts at Domain.com are ready and willing to help. Just reach out and we can provide answers and help get you started!